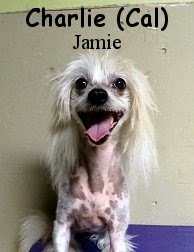 Charlie, is a rocking, nine year old, fourteen pound, Chinese Crested Dog. The most "lively" of his pack, Charlie enjoyed being at Fort Fido from the start. He spoke "Dog" well, and got to gallivanting with our Little Roll Pack almost immediately. 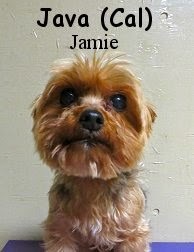 Java, is a super-cute, twelve year old, five pound, Yorkshire Terrier. This mature little fellow, is the "grandpappy" of his pack. He socialized well upstairs with the other small dogs, however, he wasn't too keen on romping around, or being ran-into by the more wile young-whippersnappers. Java handled himself well, but preferred to stay off to the side and relax, as expected. Last, but it no way least, is Truffle. 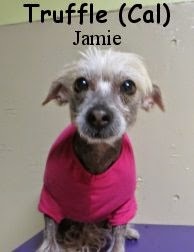 She is a fun-loving, about eight year old, thirteen pound, Chinese Crested Dog and Mexican Hairless Dog Mix. This awesome mixed-breed dog is also a rescue-dog, just like most of her pack members, cool stuff! Truffle pretty much likes to party lol. As the morning progressed and our Little Dog Pack grew, Truffle was delighted. It seemed as though, Truffle grew happier, as more and more pack members entered the play area. We were most pleased with these little dogs today. They adjusted to our joint well, and they're adequately calm and balanced, especially so, given the fact that they've all had such diverse lives. We look forward to their return, and expect them all to benefit from time spent here at The Fort.